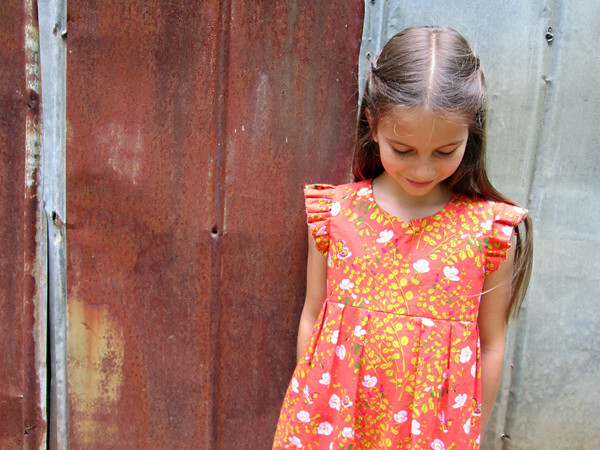 The Geranium Dress is a sweet and incredibly versatile dress pattern that includes two views. View A features flutter sleeves, a gathered skirt (top or dress length), with an optional notched neckline and an optional patch pocket. View B features faux cap sleeves, a pleated skirt (top or dress length) with side-seam pockets for sizes 18-24 months and up, and an optional cutout neckline. Both views feature a lined bodice for a lovely finished effect. This pattern is available in two size ranges, newborn – 5T (baby/toddler) and 6-12 (kid).